I have compiled photos of some of the gifts I have wrapped to give some ideas of how to wrap gifts in a beautiful way that is unique for each individual. I always like to change the style of my gift decorations to suit the personality of the recipient. I think that the presentation of the gift is just as important as the present itself. 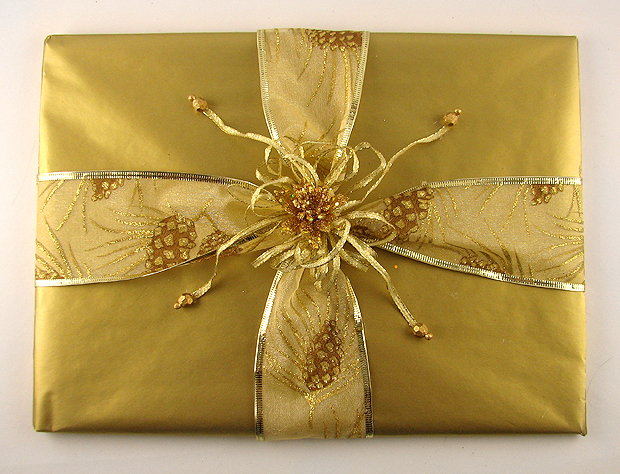 I love to see someone’s face light up when they are given a gift that has been wrapped with care. It makes them feel special and brings extra happiness to their day. 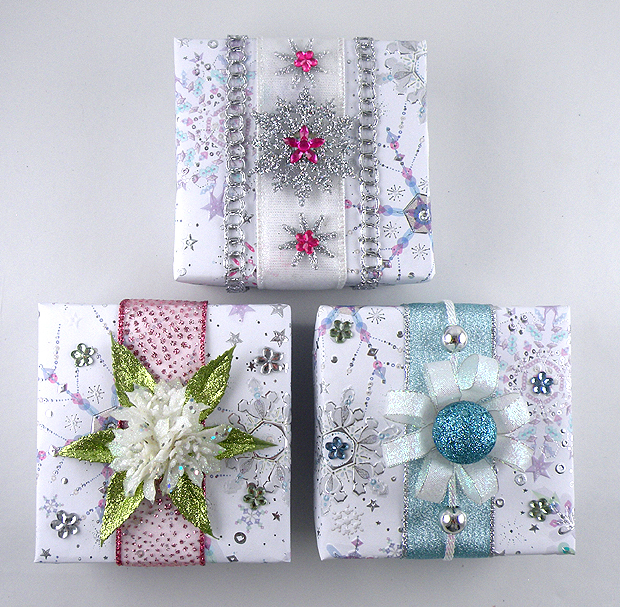 I used ornaments, beads, holiday picks, ribbons and rhinestones to make these icy gifts. This winter theme is perfect for a nonspecific holiday. I love tone-on-tone gifts. 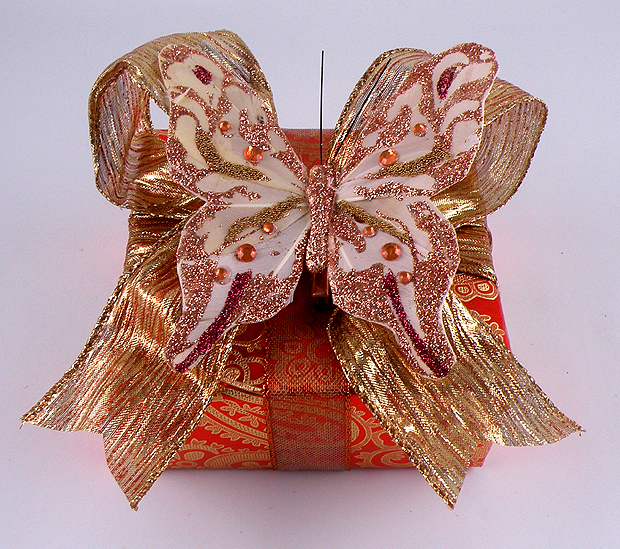 I found inexpensive butterflies at the craft store and exaggerated the wings with a big fluffy bow that I made from wired ribbon. Holiday flowers are an easy way to add elegance to a gift without making a bow. Just pull them off the stem and glue them directly on to the center of the gift. I like to cut off a few leaves and tuck them under the flowers to add a little more color. This is more of a masculine gift with the bronze leaves and beads for the brawny man who doesn’t like flowery gifts and bows. 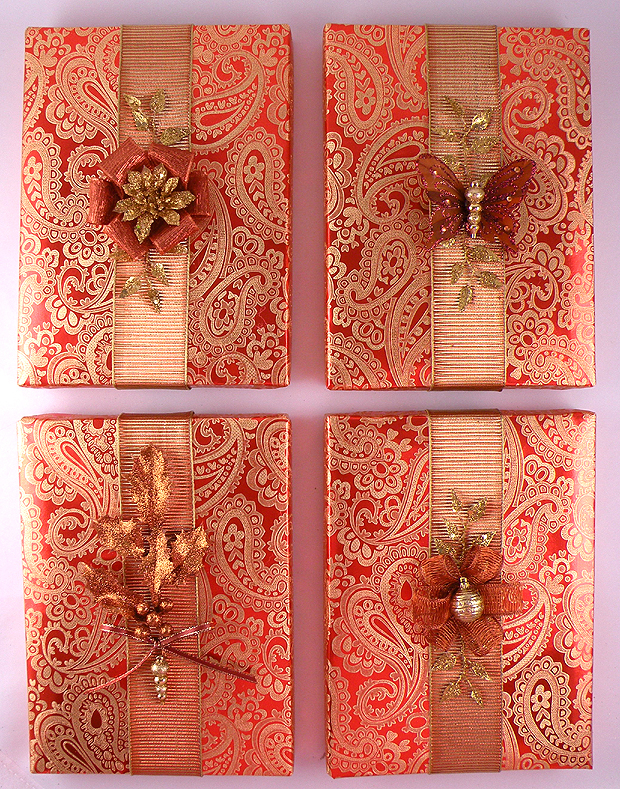 I layered two types of paper to get this look and then lined the raw edges with thin ribbon. If you notice, I matched the wrapping paper on the left bottom side to make a gift card that blends into the gift. This was just a quick five minute gift I wrapped because I had to run out the door with a present on short notice. I doubled tissue paper for the wrapping and found some ribbon pieces, beads and flowers to make look classy. You can never go wrong with a tone-on-tone gift design…it makes even the simplest gift look elegant. Tone-on-tone again but each of the accents is slightly different. I like to cut pieces off of holiday picks to attach to the gift to add warmth and elegance. These were also very quick and easy to make. 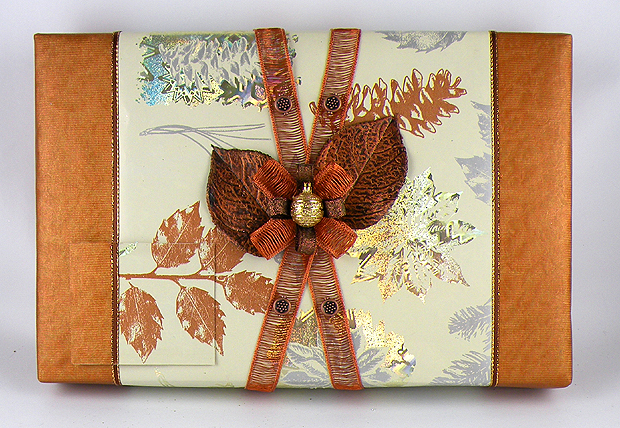 I just wrapped a band of ribbon around the gift and glued on accents. People look at these designs and at first they think they look almost same but yet somehow different…. I hope this gives you some ideas and inspiration. Just remember, there are no rules to gift wrapping. Just be creative and your gift will come out beautiful and unique. 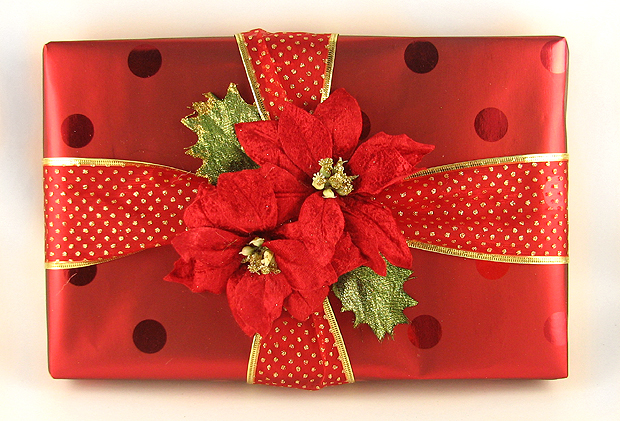 This entry was posted in Gift Wrapping and tagged 5 minute gift wrap, bows, christmas, decorative gift wrap, easy gift wrap, gift wrap, holiday gift wrap, Ribbon, wrapping paper. Bookmark the permalink.